I've found across the many products I've managed that I ultimately end up developing at least three key dashboards that I review in detail every week. They help me have a constant pulse on how well the product is performing against our objectives and reviewing them on an ongoing basis helps to build my own intuition for what's ultimately going to move the needle in the right direction. 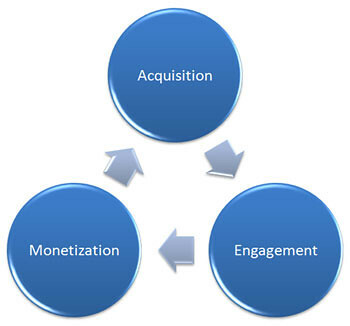 Those three dashboards are acquisition, engagement, and monetization. The acquisition dashboard captures how you are doing in terms of attracting new users to your product. If you have a marketing site for your product, this dashboard captures the funnel from homepage or landing page to signed up user. This helps you understand the drop-off points of users that are making their way to your marketing site but not fully to a signed up user. The other equally important part of your acquisition dashboard is providing insights into each of your acquisition channels and their performance relative to past performance as well as against your other channels. The specific metrics captured will depend on the specific channels you're tracking. Paid advertising might include impressions, clicks, CTR, and signup conversation rates. SEO may include keyword ranking, organic traffic to content pages, and sourced signups. In-product viral acquisition might include invites sent, invites accepted, and the funnel in-between. The point is to understand and instrument each of the key drivers for each respective channel. You'll want to also ensure you can compare the relative performance of one channel against the other. Early on this can be a simple dashboard covering signups sourced per channel. Eventually you'll want to understand the ultimate value of those signups per channel as you'll likely see the quality and value of each signup depends on it's source. One way this is often done is on an LTV basis of the ultimate value of the customer. And in more sophisticated cases, you'll need to incorporate multi-channel attribution realizing that users often have multiple touch points across your acquisition efforts before they ultimately convert to a signed up user and multi-channel attribution gives you the tools you need to understand the relative weighting of each channel. For each of the captured metrics, I find it helpful to show week-over-week performance and ultimately year-over-year performance when you have it. Year-over-year helps to ascertain seasonality so you can understand whether there has been a secular shift in the metric or simply the regular rhythms of seasonality. The engagement dashboard captures how your users are engaging with your product. I like to typically divide this into three key aspects: activation, regular engagement, and retention. Activation covers the funnel metrics from initial signup to their first meaningful engagement with the application. Some call this to the delight factor. The idea is to ensure each and every newly signed up user can immediately get to that first meaningful engagement. For example, if you are a blogging platform the first meaningful engagement is likely when they publish their first post. You'll note that there are a lot of steps between signing up for the blogging platform and publishing a post, including titling your blog, styling your blog, drafting the first post, and ultimately publishing it. The activation metrics cover each of these key steps for your product and the conversion rate of signups to first meaningful engagement. Regular engagement covers the engagement with the key experiences inside of your product. This is likely actions users are taking on a weekly basis. You'll want to make sure you don't inundate yourself with too many metrics here. Pick the most important subset that speak to meaningful activity in your application as well as the key drivers for that meaningful actions. I like to see these metrics on both an actions per user basis as well as unique users basis in addition to the absolute number. This helps you to distinguish between whether you are increasing the number of users now taking that action or increasing the depth of engagement with that action for existing engaged users. Retention covers what percentage of your activated users are still actively using the service in some retention period. This helps you understand who you have lost as an active user and ultimately didn't see the value in your application. You'll need to understand the regular rhythms of your product to decide when a user is considered no longer retained. This will really depend on the typical cadence of usage and whether it's daily, weekly, monthly, etc. I find it helpful to look at these metrics both across the entire audience but also on a cohort basis to tell if you are improving engagement for new users entering the funnel. This way you look at new cohorts in subsequent weeks and compare their performance to previous weeks to understand if you've ultimately improved the experience for new users. The monetization dashboard covers how you are effectively monetizing your users. This will ultimately depend on your business model. If you have a freemium business with both free and paid users, you'd include conversion rate of free to paid users as well as plan mix of what subscription plans were ultimately purchased. You'd also include recurring and canceled subscription metrics. If you monetize via advertising, you'd include metrics on available ad inventory, sold inventory, eCPM, total advertisers, etc. The key is to also include the ultimate drivers for the monetization in these dashboards. For advertising that could be weekly pageviews since that directly correlates to available inventory. For subscription businesses, that could be views of your pricing page or a count of your most engaged users or most likely to convert users. For subscription business understanding your churn rate and ultimately your customer lifetime value also become important for understanding the ultimate value you derive from your customers. I hope that gives you a quick overview of the three dashboards I track for every product to help have a better understanding of how the product is performing from an acquisition, engagement, and monetization basis. How Do You Know If You've Achieved Product/Market Fit?